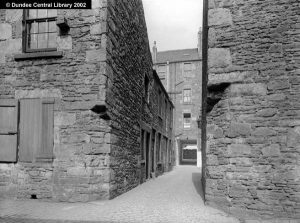 Robert McGavin, a prominent Dundee merchant, lived out his life demonstrating a quiet philanthropy within his native Dundee. Having been a man of means, he was renowned for having supported and contributed financially to many charitable ventures within the town. 78 years - Robert McGavin's death record lists his age as 74 years - the discrepancy of 4 years may have been the misinformation of the informant - his nephew Andrew Greig. Congregational church - he attended Ward Chapel in Dundee for many years. 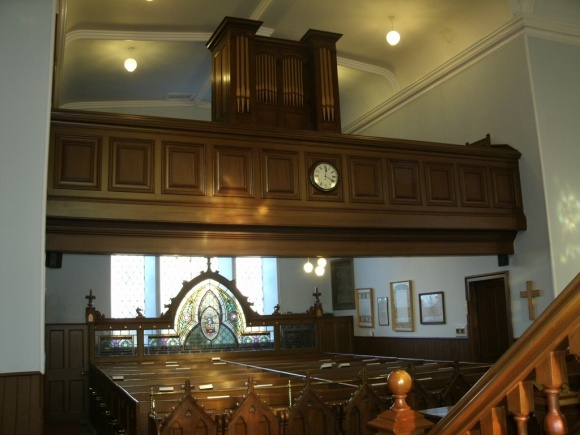 In his later years, while residing at Ballumbie, Robert McGavin attended Murroes Parish Church and gifted a stained glass screen in the North aisle, depicting the McGavin family arms. Robert McGavin took no active, public interest in politics, showing more interest in charitable institutions. Scottish Meteorological Society - Robert McGavin was admitted as a member in 1866. On the death of his father, William McGavin, Robert and his older brother James succeeded to and continued their father's business as shipowners and flax merchants. Their father had operated extensive, flax, handloom weaving operations in works at Mid Street, Lochee. His sons did not enter into the development of weaving using power looms and they withdrew from the manufacturing aspect of the business, concentrating their efforts on the mercantile side, together with shipping. James and Robert were large shipowners, engaged primarily in the Baltic trade throughout the 1840s. 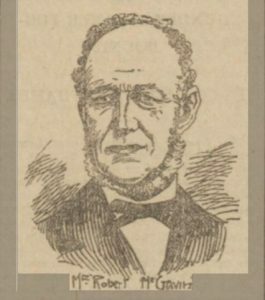 James McGavin was one of the original subscribers of a Pilotage Committee formed in 1851. Among their schooners, were two named the 'Caledonia' and the 'Viola'. The brothers purchased the Ballumbie estate in 1847, after the death of their father in 1843. 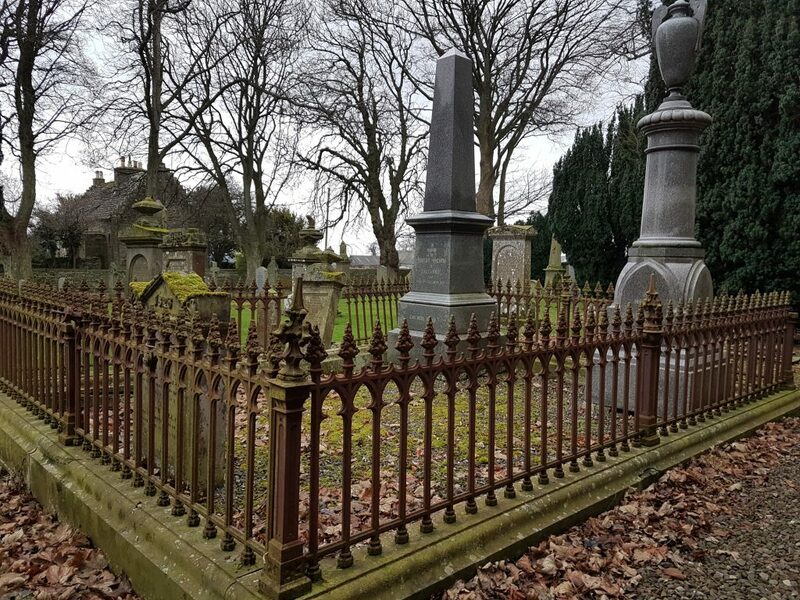 However, James McGavin died in 1854, leaving Robert as the sole operative in the business, as well as being the sole proprietor of the Ballumbie estate. 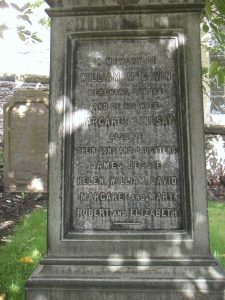 Robert McGavin also became proprietor of the neighbouring estates of Baldovie, Duntrune and Drumgeith as well as Mid and East Craigie (part of which was acquired by the town for the purpose of laying out the Eastern Necropolis). He also owned a loft and warehouse in Tannage Court, 7 Cowgate, together with houses in Park Wynd. Robert McGavin, (named after his uncle Robert McGavin), was the youngest son and last surviving member of the family of William McGavin (flax manufacturer, merchant and shipowner) and his wife Margaret Lindsay. The family lived at 11 Wellington Street. 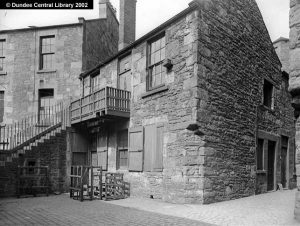 Robert’s father, William McGavin, had been a prominent yarn/flax manufacturer and ‘green cloth’ merchant, described as ‘one of the best known and largest flax merchants in his day in Dundee.’ He was also a shipowner, dealing largely in the Baltic trade. 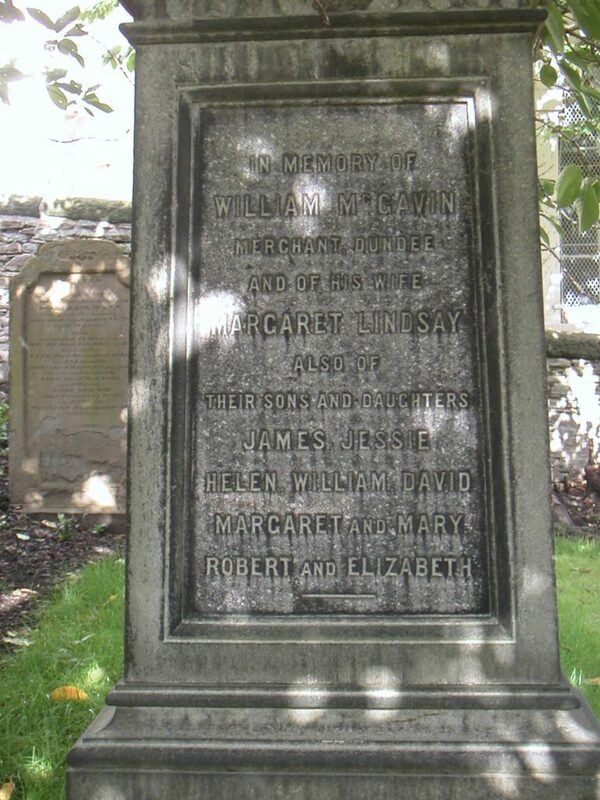 At the time of his death in 1843, William McGavin was a very wealthy man, leaving an estate valued at over £44,000. He was survived by his widow, Margaret Lindsay, and 5 surviving offspring. From William’s testamentary inventory, his mercantile interests were far-ranging in diversity and location. He would appear to have conducted business with companies from Glamis and Kirkinch in the hinterland, to global companies in Rio de Janeiro, New York, and many Baltic towns – Memel, Pernau, Liebau, Riga etc. He also owned and had shares in a number of barques, brigs and schooners. William McGavin, in his will, also expressed various wishes outwith business aspects. He declared ‘I have it in contemplation to invest on the security of landed property, or other heritable estate, of such value as will afford unquestionable safety.’ To that end, he had allocated a sum of £25,000. He wished that his trustees would bring that to fruition should he not have done so by his death. In keeping with their father’s hopes, his sons James and Robert purchased the Ballumbie estate after his death in 1847. 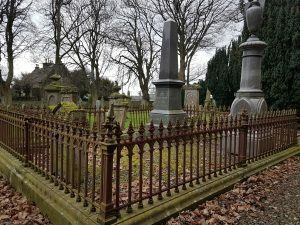 James McGavin’s death in 1854 ensured that Robert McGavin became the sole proprietor of Ballumbie and neighbouring estates. His older sister Jessie (wife of Bailie Andrew Greig Jnr – shipowner) did not survive beyond 1860, which left the responsibility of supporting an ageing mother and two remaining spinster sisters firmly in Robert’s hands. Once again, his father’s dying wishes came into play. William had stipulated his hopes that ‘they (the family members) live together in peace and mutual love and with affectionate kindness and respect towards each other until, in the course of providence, they are separated by ties or by death.’ Robert complied with his father’s wishes, ensuring appropriate provision for his siblings. Robert McGavin’s obituary declared ‘that he loved to do good by stealth.’  The evidence would seem to support the impression that he lived a life of his father’s bidding – a life that was ‘kind and just (….and trust that all (members of the family) will act in kindness and with justice to each other.’ not merely within his family but also outwith. His motivations, having been influenced by his father’s wishes, appear also to have been innately altruistic. Old Parish Registers. Dundee. Births. 1823. 282/150/170. ScotlandsPeople website. Statutory Registers. Murroes. Deaths. 1901. 313/10. ScotlandsPeople website. Dundee Courier, 08 November 1901. p.6, Findmypast website. Dundee Postal Directory, 1864-1865. Dundee Central Library, Local Studies. Dundee Postal Directory, 1867-1868. Dundee Central Library, Local Studies. Dundee Advertiser. 19 October 1866. p.2. Findmypast website. Census Record. 1861. Murroes. 313/ 2/ 9. ScotlandsPeople website. Robertson, Hamish. (2006). Mariners of Dundee - Their City, Their River, Their Fraternity. Dundee. PDQ Print Services. Legal Records. Wills and Testaments. Dundee Sheriff Court. 1844. SC45/ 31/ 6. ScotlandsPeople website. Montrose, Arbroath & Brechin Review & Kincardineshire Advertiser. 05 February 1847. Findmypast website. Valuation Roll. 1865. VR008800018 - /287. ScotlandsPeople website. The information above about Robert McGavin has been collated from a range of digital and hard copy sources. To the best of our knowledge it is correct but if you are relying on any information from our website for the purpose of your own research we would advise you to follow up the sources to your own satisfaction. If you are aware of an inaccuracy in our text please do not hesitate to notify us through our Contact page.